As an interior designer, I keep getting questions and inquiries for tips to improve a space, especially from people around me or who I visit for the first time. In many cases it puts me in an awkward position, they would be asking me about their curtain fabric, while their issues are at a much larger scale. Their curtain would be the least of their problems. People should understand the designing your space is not just choosing nice furniture or fabric, its working on the vibe of the area. if you have issues in your life it will reflect in the space you live or work in and vice versa, its just how the universe works. From personal experience as well as experience with my clients, you are the one who creates the energy around you. When I speak about energy, some people give me the look, “yeah just tell me if the colors match”, but energy is in everything around us whether we like it or not. To simplify, “sound” is energy, we all learned that in physics at school, yet we don’t see it. That’s how everything else affects us. What the Chinese have known for thousands of years, has only reached the Western World recently. The study of the effect energy has on our behavior and surroundings and the other way around. This study is known as Feng Shui. Feng Shui is no secret anymore, although 12 years ago when I first came across a Feng Shui book and read it, it was considered something very new and difficult to comprehend or explain. But through daily practices and numerous readings, I found that Feng Shui is actually more common sense than a complex study. The first rule of applying any update to your space is starting with clutter clearance. What is clutter? Clutter is piled stuff you haven’t used in a long time, it is piles of paper on your desk, it’s old shoes that don’t fit anymore in your closet, its clothes you haven’t worn in years, its old Christmas cards that fill up boxes and boxes, its a broken 1984 stereo that you will never use again, its old cassettes and vinyl record you will never listen to again, its stuff you think your children will appreciate when you leave for them in your inheritance , and the list goes on… No matter how you try to enhance your living area or office you will never feel the change unless you get rid of that clutter and deal with the actual issues behind holding on to them. I don’t want to sound as a “preacher”, but trust me, my mom will read this and laugh remembering our endless fights to clean my room and get rid of my piled up unwanted “stuff”. 10 years ago I read a book called “ Clear your Clutter with Feng Shui” by Karen Kingston and which changed my life. Personally I like all that’s eccentric and “out of the box”, its why I was interested in Feng Shui when almost no one I knew had heard of it. I bought magazines and books and applied as much as I could from them. For anyone aiming at change in his/her life I recommend that book.It is the first step to refresh your life and aim at new beginnings. It did that for me. After reading it, piles of unwanted clothes, magazines, bills, meaningless sketches, were all taken out of my room (I was still living at my parents’ at the time). Instantly I felt everything around me fall into place. Just like a breath of fresh air. It was amazing. According to Kingston, who is specialized in teaching the art of “space clearing”, the person who has clutter is mainly someone who keeps things “just in case”, others have identity issues and hold on to things they identify with and feel secure around such as gifts, many hold on to items as “memories”, all of which negatively influence us and keep us from moving on. It is difficult getting rid of clutter, but once you begin and see results you will be amazed at the results, this works every time. Try it with one small room and feel the difference in at least a certain area of your life. Here comes the idea of how clutter in certain areas of your space affects specific zones of your life. The Bagua is simply a diagram used in Feng Shui to correspond to the different aspects of your life in relation with an area of your personal space. You see, the name is complex, but the application is so easy it becomes second nature. below is a a very simple Bagua I got from Feng Shui for Real Life. Its a rectangle divided into 9 squares, each square corresponds to an area in your house, or room. You can use it for the entire apartment or for one single room at a time. The first thing you have to do is sketch the outer line of your apartment or room, divide the space in 9 equal parts, you might have missing areas , its ok, and that’s how you know what each area corresponds to. That’s how you can start knowing where your problem areas are. For example, if you are having money problems, you might find there is something wrong with the room which is at the top left part of your apartment, the problems could be clutter, broken mirror, burnt out lights etc.. 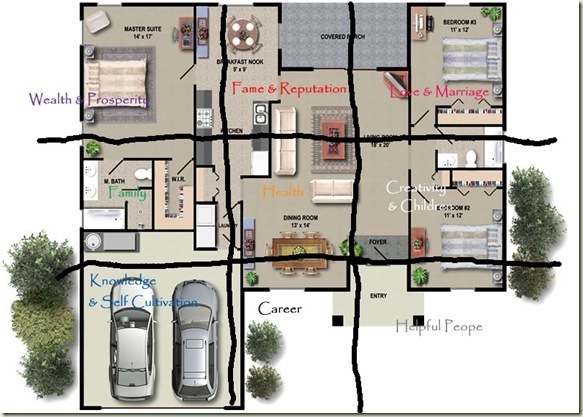 Always place the bottom part of your diagram aligned with entrance of your space. Below is an example of applying the Bagua to a plan, i got this image from a blog and found it interesting and self explanatory.You can see how the Career area is in an empty space, many cures can be found for that, I will be posting tips as we go along in this blog. I won’t add more information to this post to not confuse you, I would however love your feedback, I am willing to help out if you really want to improve the quality of your life. As we go along, I will be posting more tips that have been proved and tried that will highlight quality of life improvement. I will try to have specialized guest writers on the subjects as well. If you have clutter stories, or de-cluttering result stories, would love to hear about them. I know alot of you were expecting “actual” design tips, I will be posting these tips in future posts, however I personally think this is the most important tip of all which should precede any other interior design application. For the time being, I hope you get the book “Clear your clutter” by Karen Kingston, its written in simple English, won’t take much of your time but trust me it will do wonders, everyone I recommended the book to had life turning moments. Happy De-cluttering, and hope you all have a blessed Fitr Holiday this weekend!